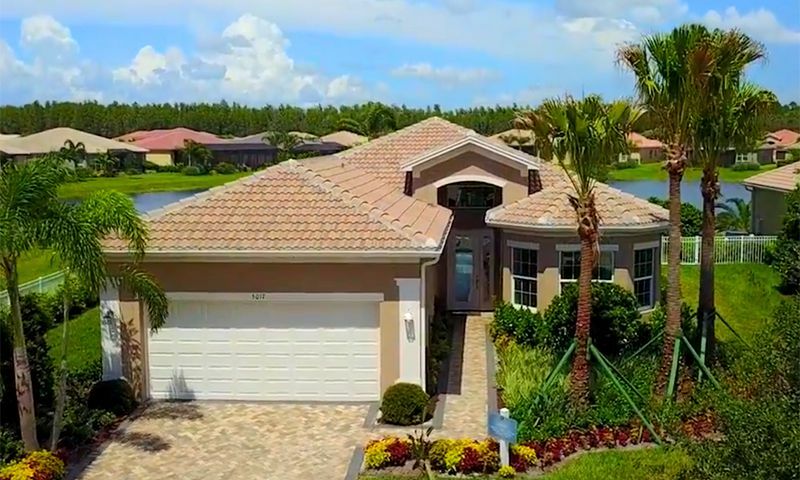 Valencia del Sol is a gorgeous, 55+ gated community in Wimauma, Florida. With an impressive collection of amenities including a high-end clubhouse, a beautiful pool area, and plenty of sport courts, Valencia del Sol offers resort-style living at its finest. A wide selection of floor plans and luxurious features allows homebuyers to personalize their residence to their preference and budget. Located in the Tampa Bay Area, the community offers residents convenient access to an assortment of shops, restaurants, and entertainment as well as beautiful Gulf Coast beaches. Valencia del Sol offers an attractive array of amenities. Within the 25,000 square-foot clubhouse, residents find an elegant foyer, a grand social hall with a raised stage and dance floor, and a catering kitchen for events and parties. A fully equipped fitness center and an exercise studio give residents a place to work out, and a massage room lets them ease back into relaxation. Artists and hobbyists have an arts and crafts studio to utilize, while card players can gather at the card room or at the sports lounge, which features poker tables as well as billiards. All homeowners at Valencia del Sol are sure to stop by the restaurant, which has both indoor and outdoor seating. Outside the clubhouse, a gorgeous, resort-style pool area, complete with a beach entry, lap lanes, and a whirlpool spa, is the perfect place to unwind in the Florida sun. After a swim, residents can warm themselves by the fire pit in the outdoor lounge. Further out, the community’s athletes can enjoy five clay tennis courts, eight pickleball courts, and two bocce ball courts, all lighted so that homeowners can play at any time. This beautiful community is also not short on green spaces, offering a spacious dog park for pet owners as well as an expansive event lawn where events such as farmers markets, movie nights, and concerts will be held. Built by GL Homes, Valencia del Sol will include 565 homes in both attached and single-family styles. The attached villas are part of the Regal Collection, ranging in size from 1,646 to 2,781 square feet with two or three bedrooms, two or two-and-a-half bathrooms, and a two-car garage. The Vintage, Signature, Crown, and Royal collections offer a wide range of single-family residences ranging from 1,492 to 3,273 square feet with two to four bedrooms, two to three bathrooms, and a two to three-car garage. Residents can choose from 20 unique floor plans and a bevy of features such as a den, library, club room, and walk-in closets. Regardless of floor plan, each home comes with granite countertops, modern appliances, and a screened, covered patio area. Residents of Valencia del Sol enjoy a low-maintenance lifestyle thanks to the top-notch amenities available right in the community. A full-time lifestyle director is dedicated to planning activities, trips, shows, and clubs for the community. Many of these events will be hosted at the clubhouse, a social hub where homeowners can gather to build lasting friendships and explore new interests and hobbies. Special events such as farmer’s markets, movie nights, and live concerts will be held on the large event lawn. Valencia del Sol is located near several destinations for outdoor recreation. Golfers can frequent several courses in the immediate area, including Caloosa Golf & Country Club, Club Renaissance, and Sandpiper Club. Beachgoers can check out Apollo Beach Preserve, just 11 miles away, to relax by the bay and visit the Manatee Viewing Center. Residents are also close to any daily conveniences they may need, including Publix Supermarket, Walmart Supercenter, and Walgreens. A variety of dining options can also be found nearby, including Little Habana, Restaurant Old Castle, Bubbaque's BBQ, and Bob Evans. Medical services are provided to the area by South Bay Hospital, just four miles away. Downtown Tampa is about a 30-minute drive from the community, while Tampa International Airport is about 40 minutes away. With incredible resort-style amenities and a beautiful location in the Tampa Bay Area, Valencia del Sol is a prime active adult community in Wimauma, Florida. Clubhouse - 25,000 sq. ft. Check back soon for more information on the lifestyle in Valencia del Sol. Attached villas are part of the Regal Collection, ranging in size from 1,646 to 2,024 square feet with two or three bedrooms, two or two-and-a-half bathrooms, and a two-car garage. The Vintage Collection features three floor plans ranging from 1,492 to 1,696 square feet with two to three bedrooms, two bathrooms, optional dens, and attached two car garages. There are five floor plans in the Signature Collection that range from 1,890 to 2,253 square feet with two or three bedrooms, two to two-and-a-half bathrooms, optional dens, and attached two-car garages. There are five floor plans that make up the Crown Collection. They range in size from 2,074 to 2,467 square feet with two to four bedrooms, optional dens, two to three bathrooms, and attached two-car garages. The Royal Collection features three luxurious floor plans with 2,623 to 3,273 square feet of indoor living space. They have two to four bedrooms, options dens, three to three-and-a-half bathrooms, and attached three-car garages. 55places.com is not affiliated with the developer(s) or homeowners association of Valencia del Sol. The information you submit is distributed to a 55places.com Partner Agent, who is a licensed real estate agent. The information regarding Valencia del Sol has not been verified or approved by the developer or homeowners association. Please verify all information prior to purchasing. 55places.com is not responsible for any errors regarding the information displayed on this website.